Timing 2 makes time tracking on your Mac easy, not a chore. I recently switched back to freelancing full-time, and whilst I am lucky enough to have clients who don’t ask for precise hourly breakdowns, I have always been intrigued to know how much time I was spending on work tasks, especially those tasks that I didn’t directly bill for. Many time trackers rely on you explicitly setting the task you are tracking and remembering to switch to another task when it’s time to track that. This is easy to forget, and for someone like me who switches tasks frequently, it’s hard to always know when one task finishes and another begins. Timing 2 takes a different perspective. Instead of tracking by task, it tracks by application usage and uses a set of rules to assign activities in those applications to certain projects and tasks. The premise is that after a learning process, you can leave the application running behind the scenes and it’ll track everything for you automatically. You only need audit the results. 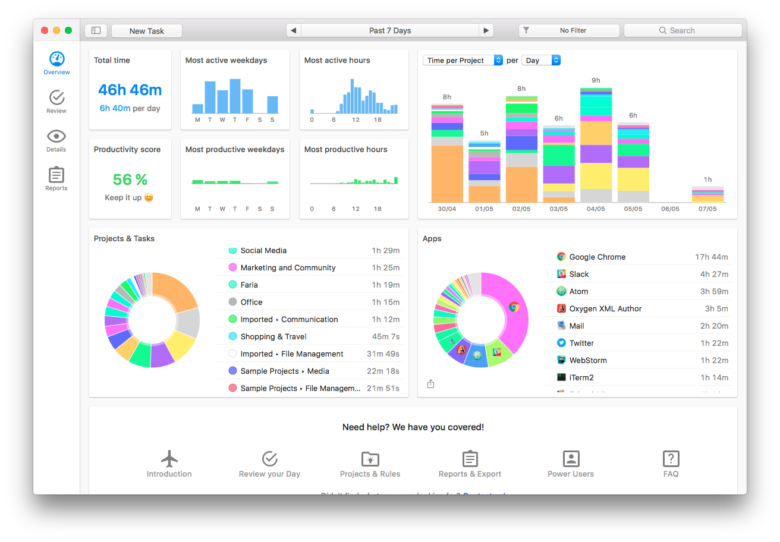 Version 2 has just been released, offering a complete rewrite and redesign to a more attractive report interface, increased stability, data export, detailed reviews of time spent and an overview of your productivity. I had been trialing version 1 of the application for the past months and by chance, Timing’s developer, Daniel Alm, contacted me and asked if I would review version 2. It was a good opportunity to dive into what I’ve been tracking and ascertain how useful it was. 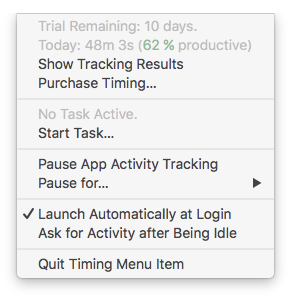 Once you start Timing it runs happily in the background and your frequent interactions with it will be via the menu bar, giving you the option to start and pause tracking, manually set activities and dive into details. When you’re ready to see what you’ve been up to, open the main Tracking Results window for a summary and investigate in further detail. What hit me first was how much Timing is able to track — most of the time you have details of individual windows, files and paths opened. 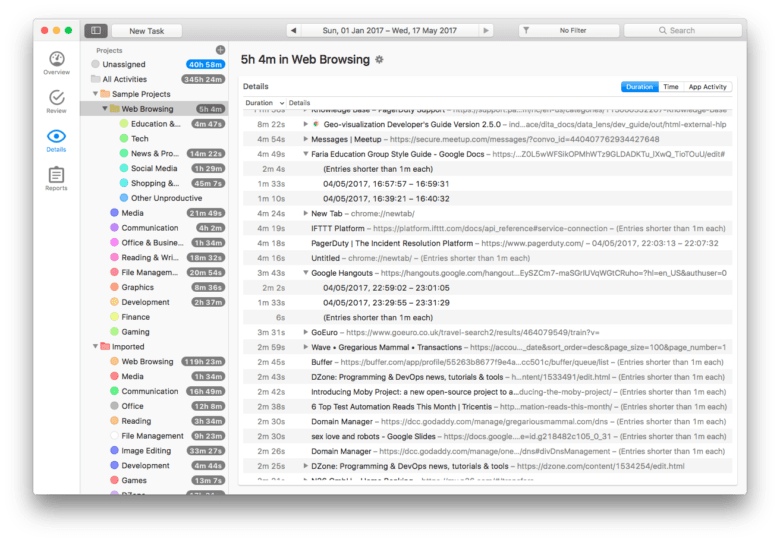 For example, if I open up one of the large chunks of time spent, web browsing, I can see the individual pages I visited and how long I spent on them. You can manually drag entries into their relevant categories on the left-hand side, but that’s not a smart approach. Instead, ⌥ + drag an entry and it will create a new rule, automatically categorizing in the future. For more technical tasks you will see that Timings still has you covered. For example with one client, I use the Atom editor, Tower (a Git client) and Oxygen (a Java-based XML editor), all built in fundamentally different ways, and I can access detailed information on my work with all of them. 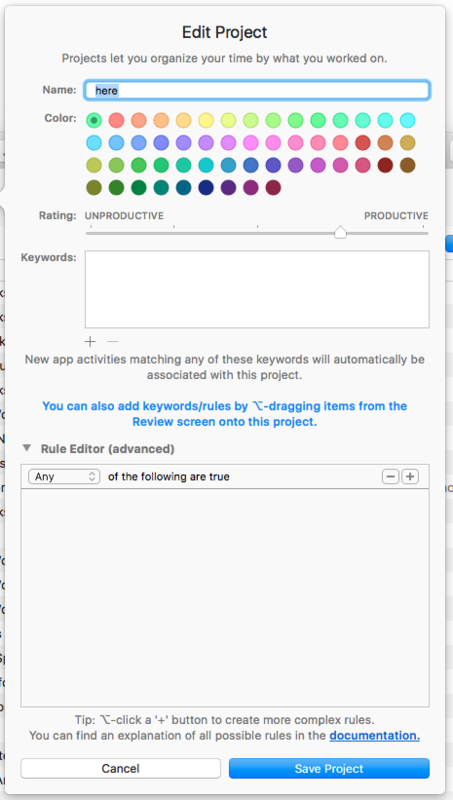 To add or edit a project, open its labels and you can define a name, label color, a level of productivity and advanced rules based on keywords, file paths, and other aspects. Once you are happy with your project report for a period, jump into the Reports section to export results into a variety of formats for a client, accountant, or even a web page. Now you know what Timing offers, does it help track time or make yourself more productive? Here are my results from a few weeks ago, and bear in mind that I have not fully categorized this yet and that Monday 5th was a public holiday in Europe. That I work less each day than I thought, which is encouraging. I am most active in late morning/early afternoon. I spend a LOT of time in a web browser and Slack. I need to spend more time on the projects that I don’t bill by the hour for. I am possibly overbilling on my per-hour work. These are not all facts you might want to hear, but at least now I know where there is room for improvement. Productivity, $29. 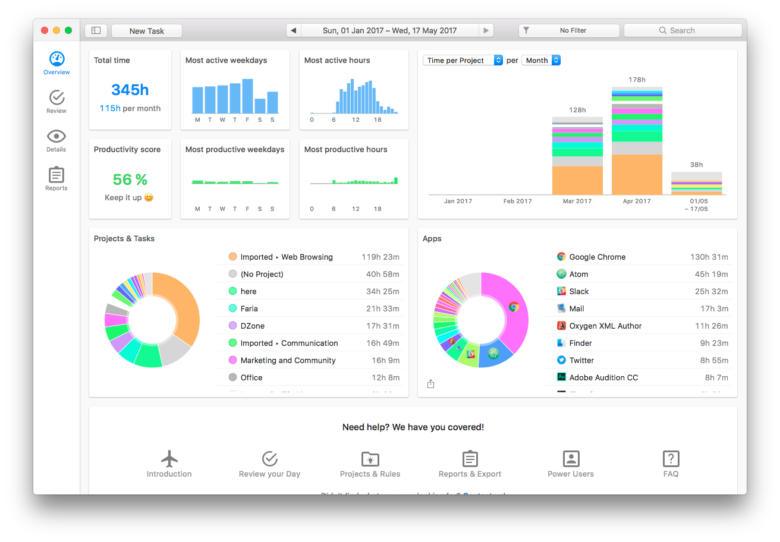 Tracks the user’s detailed app usage and productivity score. Professional, $49. This edition adds manual task creation (to categorize blocks of time), start/stop timers, reporting capabilities, and work-related features such as restricting tracking to specific hours. Expert, $79. Includes advanced filtering options, fully customizable reports, AppleScript support, and more. Timing 2 is also available on SetApp, a software rental service that we reviewed favorably. 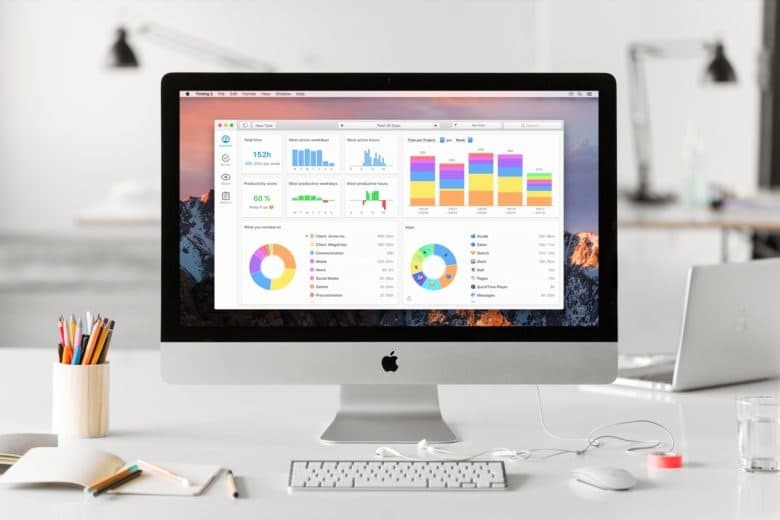 Bottom line: When compared to other time tracking services that charge per month, I think Timing 2 is good value, and for me personally, the application-level tracking fits much better into my workflow. Recommended.